Happy Wednesday!! Half way through the week - hooray! Here are a few items and thiiiings I have been eyeing for a while now and would love to get my hands on. I recently discovered this rad clothing company Pyknic on instagram. It is truly a company after my own heart - combining fashion and food, utterly brilliant. These Dolce & Gabbana glasses are my dream glasses. The shape is super flattering, sort of a rounded cat's eye and don't even get me started on the colour! OMG could they be more amazing? I've tried growing my hair to some sort of substantial length many times throughout the years but I always get antsy during the growing out process and end up cutting it. This isn't really current but Lana looks sooo stunning in this still from Ride that I thought I'd use it for inspiration to get me through those blah hair days. haha. N.B. I'll let Lana keep the long locks. I've cut my hair shorter than I've had it in a long while and I love it! And here's a little something to adorn those luscious Lana locks. hehe. 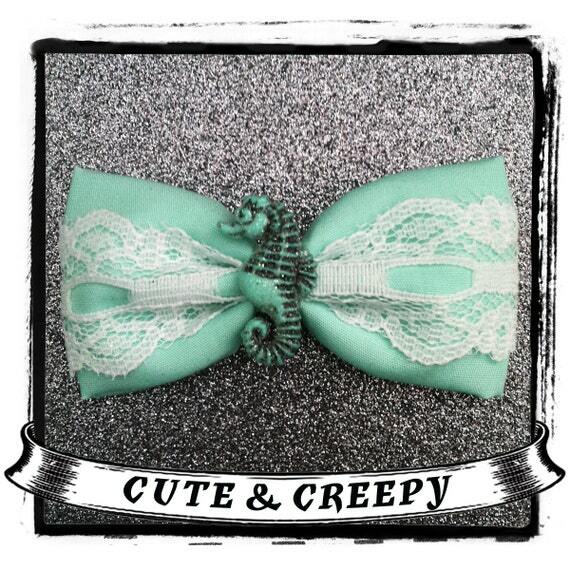 I love the selection of bows at this etsy shop Cute & Creepy. The colour of this bow is great and I pretty much love anything sea-life themed. Yay for seahorses!! That crop top is calling my name! I'll be checking out that website for sure.